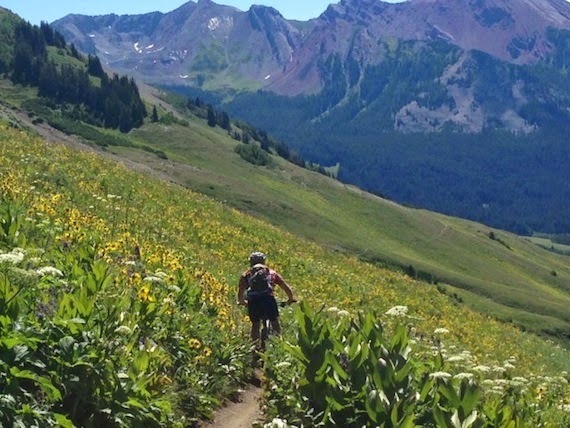 I wish I could say that this trail blazer was me, but I can only dream of tackling this trail--a gem of one, if I might add--in Crested Butte, Colorado. You see, it was my husband who texted me this photo from the mountain town we fell in love with back in March during a ski weekend (as for the trail name, I'm drawing a complete blank on what he called it.) He was doing the mountain biking, and he "kindly" wanted to show me what I was missing as I chugged along on the trainer logging those Ironman miles. Judging from the picture, CB is as awesome in the summer as it is in the winter. Jealous? Absolutely. Not only does the greenery stretch for miles, but the trail doesn't look too rugged for these terrible-at-mountain-biking legs. Even though the saddle on my mountain bike is about the most uncomfortable thing ever (that's what a bike upgrade complete with new Adamo saddle will teach you), I probably would have sucked it up just to avoid the hours I was pedaling...indoors. Not by choice on that trainer sesh, mind you, but it was the best option I had in southeast Michigan where I was spending the weekend. And I definitely could have taken a slice, or two or three, of pizza from The Secret Stash after my ride. There's always next year. That's what I'm telling myself anyway. I have an absolute love affair with Colorado. Between the sun and mountains, I can't imagine living in a more perfect place in the US. I usually run in Rocky Mountain National Park...which I recommend to everyone!! !